BumbleBeads Designs: Bead Soup Blog Party: My beads have arrived!!!! 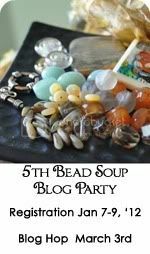 Bead Soup Blog Party: My beads have arrived!!!! My partner Shanti Johnson and I shipped our beads at the same time, so, of course we got them at the same time. Except I "got" mine a few days later cause it was cold and snowy this week and no one wanted to walk/drive the "long" distance to the mailbox that was down the street. But, yesterday, I went to check the mailbox and was so excited to see the package that I literally danced/jumped all the way back home. Shanti sent me a beautiful bead soup mix. I love the colours and the toggles. Here's the soup of beads and some closer shots. The mixture had two orange butterfly focal beads which I can't wait to use. I love butterflies and I'm always looking for more butterflies to make into jewellery. There's also a leaf toggle and a cute little elephant clasp. Another favourite are the orange rondelle beads. Love them! Not sure what I'm going to do with it yet but it is definitely going to take me out of my comfort zone of pearls and bridal jewellery making. Can't wait to get started! Did you notice the editing done on the pictures? I just discovered an updated version of Picassa that integrated Picnik's editing tools. Love it! 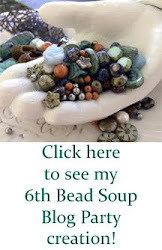 Remember the Bead Soup Blog Hop is on March 3rd! Also, visit Shanti's blog to see what I sent her! 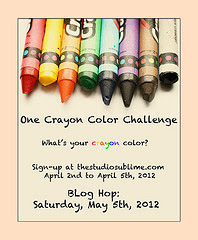 And of course, go check out Lori Anderson's blog, the host of this party. Gre8t! Can't wait to see ur creations! Wow! I just read your post! The poem was beautiful! And the necklace beautifully represented it. It's really pretty! Looks like a ton of fun. That elephant lobster is sooooo cute. Amazing colors, remind me of sun, fun and the sea!! What fun! These colors make me smile! That's what this party is all about, taking you out of your comfort zone. This is a great mix. I think I love every single bead here!